Aly Raisman, with McKayla Maroney (in the black dress) partly visible. Left to right: Jordyn Weiber, Gabby Douglas, and Kyla Ross. Way to go, Team USA! Well, maybe not the extra mile. The extra yard. Or meter, since that's what they seem to prefer at the Olympics. 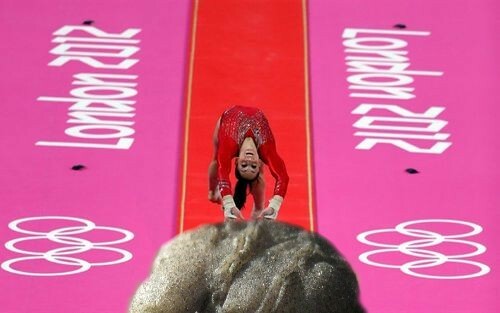 "Gabby Douglas, now that you've won the Gum Medal where are you going?" "I'm going to wash my hands!" She should be okay as long as she only touches the ribbon.